Great workout, I am loving TRX! MM2019-One of the best instructors! Thanks for a great workout!! MM2019 – grabbed a friend and made her do it with me! Awesome!!! MM2019. 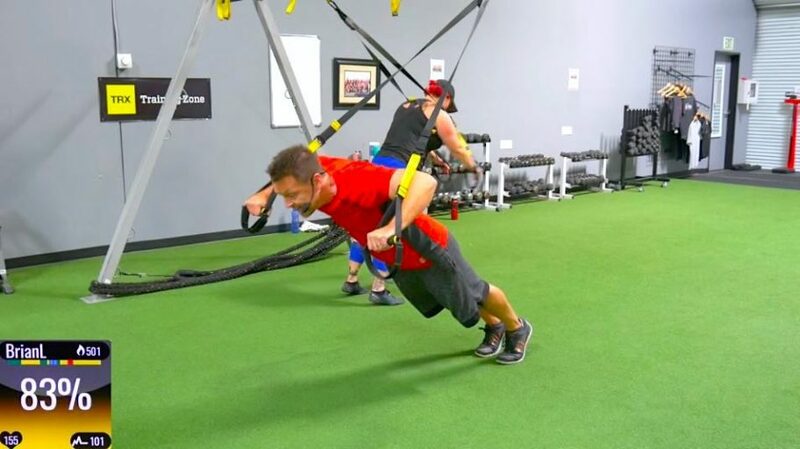 This is one of my favorite TRX classes! Thanks Brian! One tough workout! Couldn’t finish, after 30 min in. This is one where I’ll have to work up to. MM2019. One of my new favorites- thanks Brian! You always make hard work fun! MM2018 – Did this at the gym b/c I don’t have TRX at home! Super fun! MM2019 – great TRX class Brian. MM2019-Brian is one of my favorite trainers for sure. You are so real which makes me enjoy your class that much more!! Awesome class, Brian! Love the positive energy! Great class! More TRX please!!! Never underestimate TRX Great Class! Loved the workout! Certainly kept my heart rate up. Thanks Brian! Yes, more TRX please!! Been doing it at home by myself and it’s so much better when someone else tells me what to do and picks the music! My daughter AJ (Abigail Joy, 5.5 months) was rolling around on the floor and joined in on the plank sets!!! Such a great workout. Burning muscles and lots of sweat. and as always such a fun attitude and plenty of laughs. Thanks for the shout out too! loved this! I got a TRX for Christmas and enjoy the new class. Absolutely flew by which is my universal test of a good class… Great that we kept a lot of the cardio still on the straps as really helps me with quality plyo. Let’s keep the TRX sessions coming. Thx Brian for quality coaching throughout. Yeah! TRX inside; blizzard outside! Another great class from Brian and his lovely guests. Thx to all. Just watched this class to see what I might be getting myself into and I love it sitting and watching,,,,might not have so much love when I get it on,,,,Great work Brian and AJ was an extra bonus,,,Thanks!!! Such a fabulous, fun and sweaty class. Love a new TRX addition to the library- the added cardio was such a bonus to keep the HR up. Brian is really a favorite trainer. That was one of THE best TRX classes ever!!!! I also love that I was right there with AJ trying to keep up!!!! Love love love!!! Your stories and sense of humor are second to none!!! I always crack up at your big head stories!!! On a side note, we (my husband and myself) got our Super Bowl t-shirts…the slogan is “Still Here! !” Only when the Giants aren’t playing, my husband can bribe me to wear one for the Super Bowl party!!! Wearing it with pride!!! The guy walks his pitbull in a pet carrier during a snow storm!!! I must add one more thing…..we live to poke fun at our son!!! We’ve wrapped him up in shrink wrap around a pole and convinced him that it was his idea LOL!!!! The foundation joke was something we would do!!! That was awesome! Loved your comments and encouragement throughout, and especially in the stretch when you mentioned how bad the “pollens” were in the theatre when you saw A Star Is Born! Agreed! That was a great class, Brian, thanks so much. Man you are so funny !!! Thanks for the great class and the laugh !! Who said TRX isn’t fun !!! Great class Bri, it’s been a while since I’ve done a TRX. Cheers. All right TRX® SWEAT PEEPS, get ready to rock and transform that body. You’re going to carve and tone, as well as challenge yourself with heart pumping cardio drills to keep you sweating non-stop. You… Won’t… Stop. Three big super sets Studio SWEAT style. Go get it! You’re going to love this fast paced, high energy class, full of non-stop action, including cardio drills and various exercise techniques using your power tool, TRX! This is going to be the ultimate test of your physical stamina, muscular strength and endurance. Your metabolism will sky rocket with the constant moving and changing pace. Don’t waste anymore time. Get to it! You have been heard y’all and this class had each of you in mind! Trainer Brooke takes you through 5 Rounds strictly ON the TRX®, followed by ascending ladder cardio drills on the floor. You’ll be challenging your body and going beyond what you thought it was capable of doing. Oh, YES YOU CAN!! !